Below is a very encouraging chart as we close out 2016. With a President elect decided we have a very good chance of moving higher through year end. Sure in 2008 we were in the middle of an economic disaster and many people forget the protracted legal battle and “hanging chads” that kept the 2000 Presidential Race on hold until December 12, 2000 when a 5-4 decision by the Supreme Court ultimately awarded Florida’s electoral votes to George Bush providing him with the path to victory. But in most “normalized election years” the markets move higher after a President is chosen. During presidential election years going back to 1928, the S&P 500 index has been in the positive 73% of the time (16 out of 22 years). The average price gain of the S&P 500 during election years was 7%, which trailed the 7.4% gain for the index during all years. When a Democrat was elected as President of the United States, the S&P 500 was up for the year 58% of the time (seven out of 12 years) and saw an average price increase of 3.3%. When a Republican was elected as President of the United States, the index was up for the year 90% of the time (nine out of 10 years) and posted an average price increase of 11.4%. When performing this same analysis for the Dow Jones Industrial Average, we see a similar story. That is, the index tends to underperform during presidential election years when a Democrat is elected (compared to when a Republican is elected) and also underperforms during election years in general (compared to all years). This is shown in the two charts below. What Does History Indicate about the Final Two Months of Election Years? As of close on November 1, 2016 the S&P 500 is up 3.3% year-to-date. Looking at the final two months of presidential election years going back to 1928, the S&P 500 index gained in value 64% of the time (14 out of 22 years). The average price increase was 1.9%, which trailed the 2.1% average increase in the final two months of all years. When a Democrat was elected as president, the S&P 500 posted an average price gain of 0.6% (during the final two months of election years), which was well-below the 3.6% average gain when a Republican was elected. 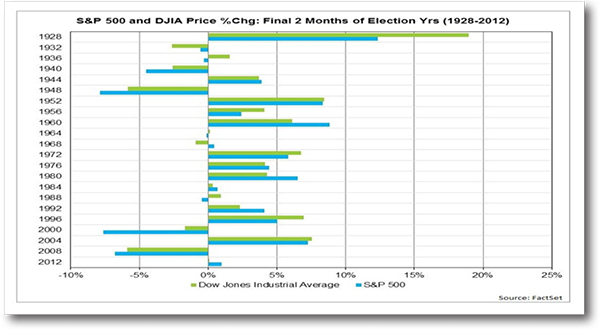 When performing this same analysis for the Dow Jones Industrial Average, the average price increase in the final two months of election years actually exceeded the average gain in the final two months of all years by 0.3 percentage points. The effect that the elected political party had on the Dow’s price movement was consistent with that of the S&P 500 index. Looking at the first year after the presidential election (going back to 1928), the S&P 500 index has increased in value 55% of the time (12 out of 22 years), with the average price gain amounting to 5.1%. When a Democrat was elected president, the S&P 500 was in the positive during the first post-election year 75% of the time (nine out of 12 years), with the average price increase equaling 11.7%. When a Republican was elected president, the index was in the positive only 30% of the time (three out of 10 years), with the average price change amounting to -2.8%. Keep in mind that this represents a stark contrast to the price change for the S&P 500 during election years, when a Democrat was elected versus a Republican. 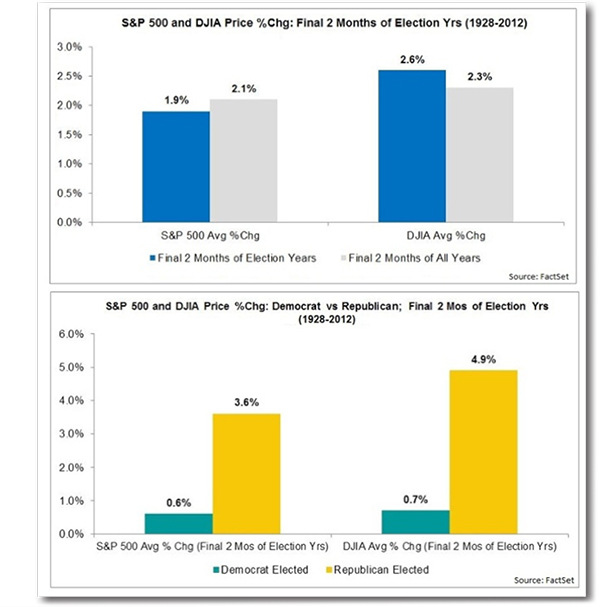 In election years, when a Democrat was elected as President of the United States, the S&P 500 underperformed (compared to when a Republican was elected) on average by 8.1 percentage points. As shown in the chart below, the third post-election year experienced the largest price gain for the S&P 500 on average. During the third year after the presidential election, the S&P 500 increased 12.8% on average, which exceeded the 7.4% annual gain for all years (going back to 1928). No other post-election year logged an average percentage increase that beat the 7.4% watermark. From a political continuity perspective, a Hillary Clinton win would be better for the market in the first year after the election, based on history. On average, the S&P 500 index increased in value by 9.8% in the first postelection year when the political party of the president transitioned from a Democrat to a new Democrat. Keep in mind, though, that this has only occurred twice since 1928. 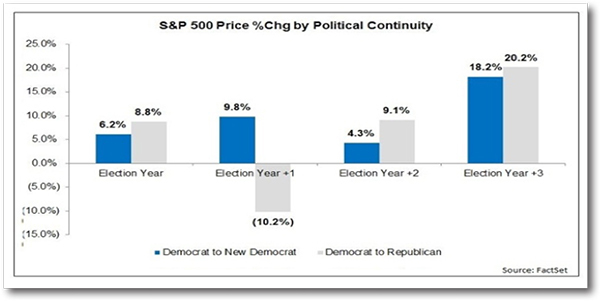 Contrastingly, the S&P 500 decreased in value by 10.2% on average in the first post-election year when the political party of the president shifted from a Democrat to a Republican. This has occurred four times since 1928. It is interesting to note that in the second and third years after the election, the Democrat to new Democrat transition underperformed the Democrat to Republican shift. 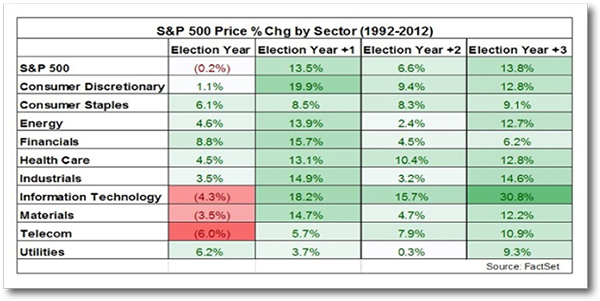 Looking at post-election years going back to 1992 (when all S&P 500 sector data is available), the S&P 500 index still performed best in the third year following the presidential election. At the sector level, the Financials group saw the largest price gain during election years, posting an 8.8% average jump. The Telecom, Information Technology, and Materials sectors were the only groups to log an average price decline during election years. In the first post-election year, all S&P 500 sectors saw an average price increase, with the Consumer Discretionary group leading the way (+19.9%). The Information Technology sector led all groups in terms of price performance for the second and third years after Presidential elections. Once again, all S&P 500 sectors posted a price gain on average during these years. Every election cycle is different and this one has been especially interesting, maybe even taxing and overwhelming. Social media has played its largest role yet, WikiLeaks was never a factor before, hacking fears on election day are a problem many of us are facing for the first time. Many experts feel the country will grind to a halt tomorrow as we turn to our TV sets and watch the outcome unfold. By most accounts it’s a Dead Heat. In addition to the headwind of electing a new President we have a supreme court with only 8 members (4-4 by the way), a federal reserve intent on raising interest rates, a country seeking to grow GDP in the face of high corporate taxes, challenging Affordable HealthCare mandates and stagnate wage growth. 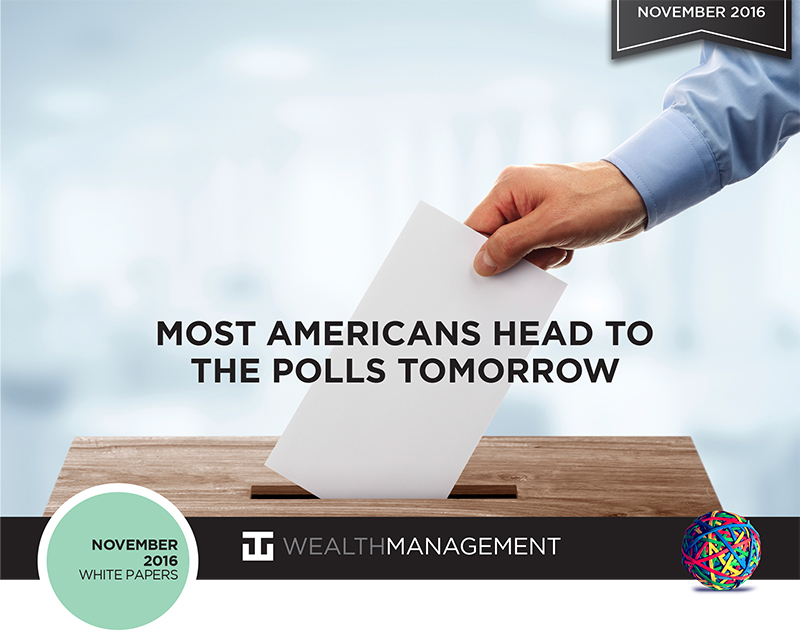 A new President and a fresh mandate may just be want this country and stock market needs to move forward and higher. After doing this for nearly 25 years the one thing the market hates is uncertainly and the unknown. Come tomorrow evening one of the major unknowns will be removed and we can begin the process of managing for more of the knowns than the unknowns.